Rajasthan which is also known as the “Land of Maharajas” is the largest state of India, covering an area of about 342,239 sq. km. 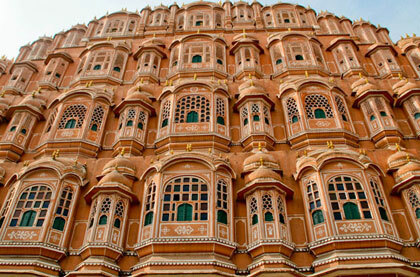 It comprises of 33 districts and its largest city is Jaipur, which is also its capital. Being located on the western side of the country, it shares its border with Pakistan to its northwest and to the west it shares its border with Sindh. To its north it has Punjab, Uttar Pradesh and Haryana to its northeast; to its southeast it has Madhya Pradesh and Gujarat to its southwest. The glory of the state is retained by its majestic palaces, forts and monuments. The vibrant culture and rich heritage of this princely state draw innumerable tourists from across the globe. 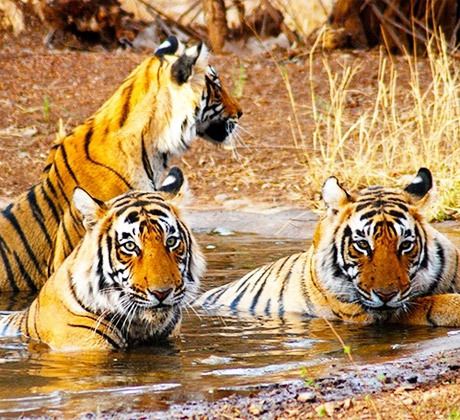 Its major attractions include the ruins of Indus Valley Civilization, the oldest mountain range- Aravalli, a Jain pilgrimage site known as Dilwara Temples, Karni Mata Mandir, the only hill station of Rajasthan - Mount Abu, Keoladeo National Park (formerly known as Bharatpur National Park, the Ranthambore National Park and the Sariska Tiger Reserve. Some of its major architectural wonders include Chittorgarh fort, it is the largest fort in Asia, Mehrangarh Fort at Jodhpur, Jaipur “The Pink City” houses a number of well known tourists spots which include Hawa Mahal (Palace of Winds), Lake Palace, City Palace, Amber Palace, Jantar Mantar, Umaid Bhawan in Jodhpur, Jaisalmer Fort in Jaisalmer and many more. Land of people who are brave and chivalrous, people with a warlike lifestyle around whom grew the most amazing legends of romance ad heroism. There is a certain magic about traveling through Rajasthan. Summer (April to June) : Summer A summer, which extends from April to June, is the hottest season, with temperatures ranging from 32 degree C to 45 degree C. In western Rajasthan the temp may rise to 48 degree. 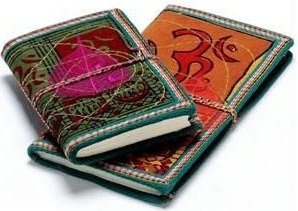 The origin of the customs and traditions of Rajasthan is easily traceable to the cantos of the Vedas, wherein specific rites and ceremonies are prescribed in the minutest detail for the Samskaras in the life. Batik is a medium that lies somewhere between art and craft, and is believed to be at least 2000 years old. The Batik technique is a development of resist printing. The fabric is painted with molten wax and. The Dargah Sharif or the place of Where the Muslim saint KhajwaMoinudin Chishti lie sburied, draws piligrams and devotees from all parts of the Islamic world. But his admirers today come from all religions. 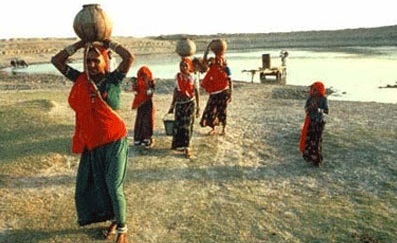 The Desert of Rajasthan is situated partly in India and partly in Pakistan. Bordering the desert on four sides are, Indus plains to the west, Aravalli Range to the southeast, Rann of Kutch to the south. 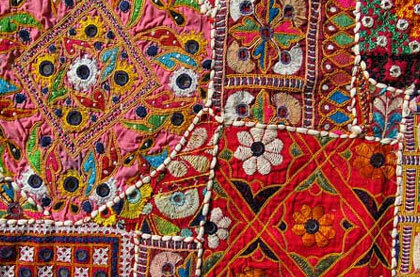 Paper making in Rajasthan dates back to 1520s when mughal emperors encouraged this art and established a paper industry here. It was Maharaja Jai Singh II who bought this art to Jaipur and set up a paper. Miniature Paintings : Although miniature painting is most often associated with Mughal art, it dates back many centuries in India where different styles developed. Yes, a major change in style occurred. In a society that was as well formulated as that of Rajasthan, it was expected that there would be systems of both healing as well as preventive cures, and ways of aiding longevity, The royal palaces. 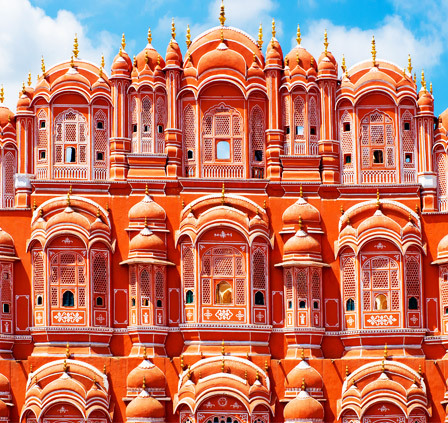 Jaipur, popularly known as the Pink City, the capitalof Rajasthan was founded in 1727 AD by king Sawai Jai Singh. The pink color was used at the time of making to create an impression of red sandstone buildings of Mughal cities - and repainted in 1876. 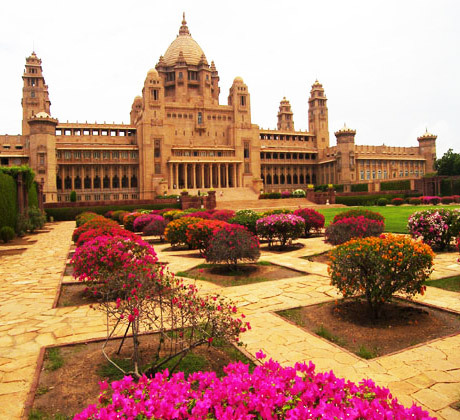 Jodhpur is also called as the "Sun City". 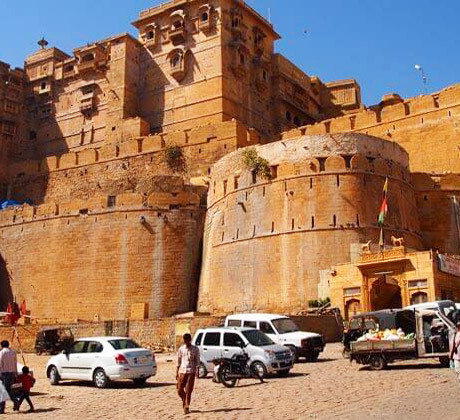 Jodhpur stands at the edge of the Thar Desert & was citadel of the ancient Marwar kingdom. This bustling desert city is the second largest city in Rajasthan after Jaipur and has landscape dominated by the massive Meherangarh Fort topping a sheer rocky ridge. 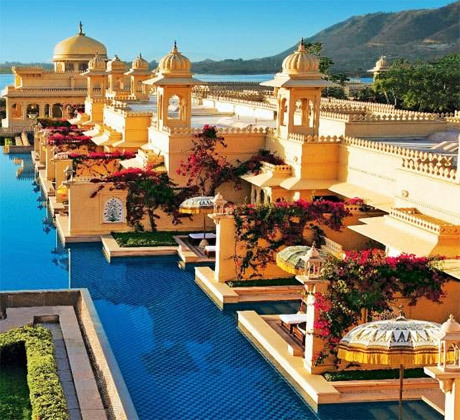 Udaipur is known as the Venice of the east. It is also called the city of lakes. The Lake Palace on Jag Niwas Island in the middle of Pichola Lakes is the finest example of its architectural and cultural explosion. 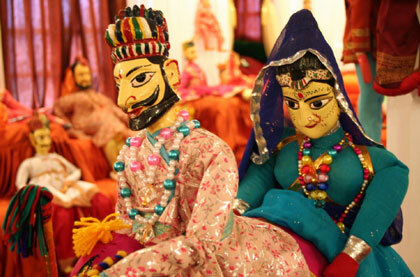 Udaipur is also the centre for performing arts, craft and its famed miniature paintings. 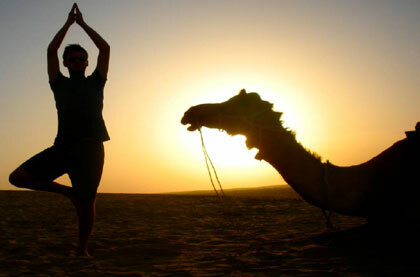 The name JAISALMER evokes a vivid picture of sheer magic and brilliance of the desert. The hostile terrain not with standing the warmth and colour of people is simply over whelming.And you can let your eyes caress the sloppy sand dunes while you ramble your way in a camel safari. Lying in the north of the desert state, the city is dotted with scores of sand dunes. Bikaner retains the medieval grandeur thatpermeates the city's lifestyle. More readily called the camel country the city is distinguished for the best riding camels in the world. 355 km southwest of Delhi lies the holy small town of Pushkar in the state of Rajasthan. 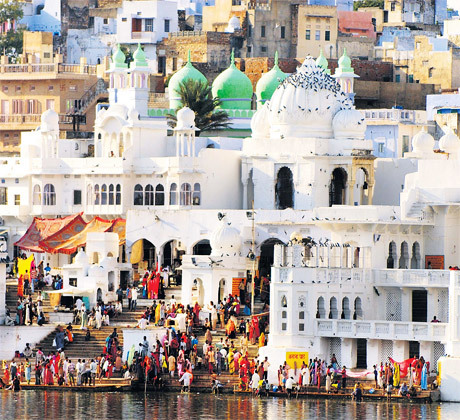 The sacred lake, which is the major attraction of Pushkar, is visited by the Hindu pilgrims in multitude. 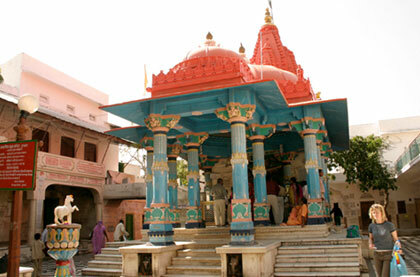 The town of Pushkar has the unique distinction of being home to the temple dedicated to Brahma.. The name JAISALMER evokes a vivid picture of sheer magic and brilliance of the desert. The hostile terrain not with standing the warmth and colour of people is simply over whelming. And you can let your eyes caress the sloppy sand dunes while you ramble your way in a camel safari. 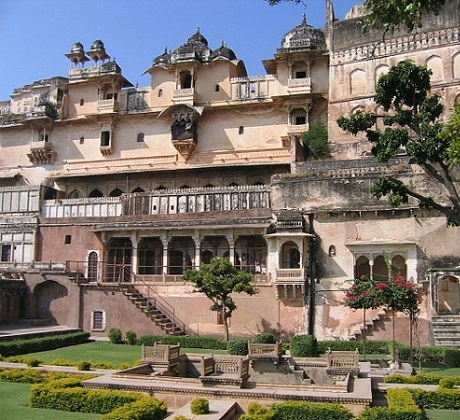 Bundi is a magnificent town, 36 Kms from Kota, once ruled by the Hada Chauhans. First destination is Hadoti set in a narrow inclining gorge. The palaces and forts have a fairy tale quality about them. 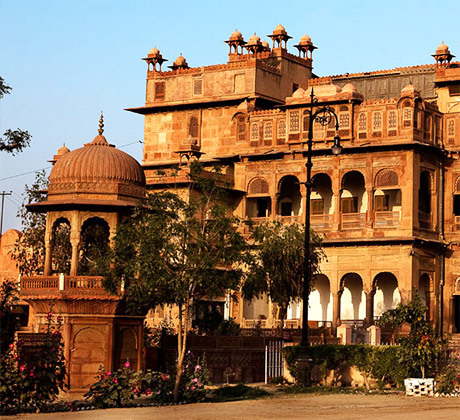 Rajput architecture shines in the intricately carved brackets and pillars. Interesting places are Diwan-e-aam, Hathia Pol, and Naubat Khana. 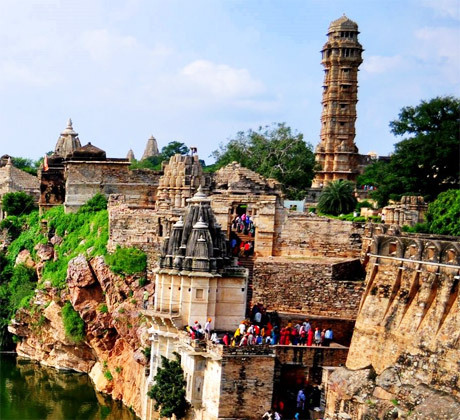 Chittorgarh has been a witness to some of the bloodiest battles fought on Indian soil. The city itself was ravaged thrice staring with Alauddin Khilji's attack in 1303 AD followed Bahadur Shah in 1533 AD. Mughal Emperor Akbar attacked the city for a third time and razed the Chittorgarh fort to the ground..